Nine different species of dolphin are found around New Zealand’s coastline. 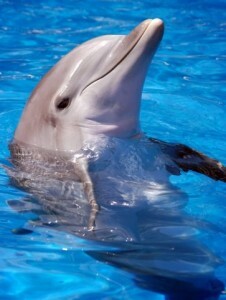 All dolphins in New Zealand are protected by the Marine Mammals Act, which is administered by the Department of Conservation. Species that you may see include bottlenose, dusky and Hector’s dolphins. This is one of the larger species, reaching up to 4 m in length. They are very friendly and are often encountered near the shore in small groups. They are light to dark grey on top fading to white on their belly. 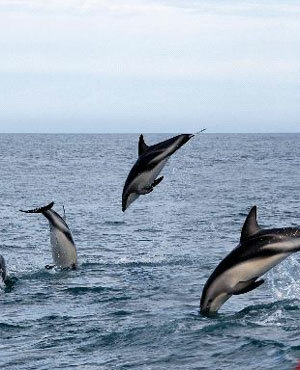 The Dusky dolphin is very playful and loves to ride on the bow wave of a boat and pull off acrobatic moves. They feed on schooling fish and often a pod will round up hundreds of fish and takes turns at feeding. They grow to about 2 m and have blue-black backs with a light grey underbody. 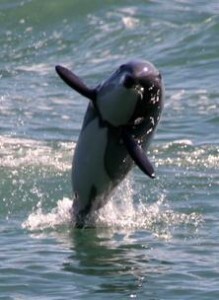 They are common around Kaikoura, where they are seen near the shore from late October to May and further offshore during the winter months. This is the World’s rarest dolphin and only occurs around the coast of New Zealand. There are three genetically distinct populations of the dolphin: on the west coast of the North Island and on the east and west coasts of the South Island. They feed close to the shore on small schooling fish, such as yellow mullet and squid. They have a very slow breeding rate. Only one calf is born at a time and they generally give birth every three years. They usually grow to about 1.4 m. They have light grey to light brown backs and a whitish underbody. The tips of the lower jaw, fins and sides of the head are all black.